We also service commercial parking lots, regular sealing is crucial to maintain the asphalt as well as uphold the appearance of the lot. Call us today or click here to schedule an estimate, we will have a friendly, experienced estimator out promptly to measure the parking and fax, email or mail the proposal. Clean asphalt and cracks of most debris that will impede the curing of the sealer using wirebrushes, power leaf blowers, and scrapers. Prime any severe oil or chemical stains with SealMaster® Petro Seal oil spot primer. We will apply the primer with an 8 inch acid brush and allow appropriate cure time for the primer to dry. Dry or old chemical stains often do not require pretreatment. Note that severe chemical stains can bleed through. Pre-treat most large linear cracks wider than ¼” with pourable liquid crack filler. Click here to view our crack filling service. Note: If you prefer, we can also provide an estimate for hot pour crack filling. Hot pour crack filling involves SealMaster® CrackMaster™ P.L. The hot pour crack filler is applied at a temperature of 370-390°F, and is a more durable product than the cold pour crack filler. It is recommended for parking lots that get significant vehicle traffic as it protects the cracks from expanding over a longer period of time. 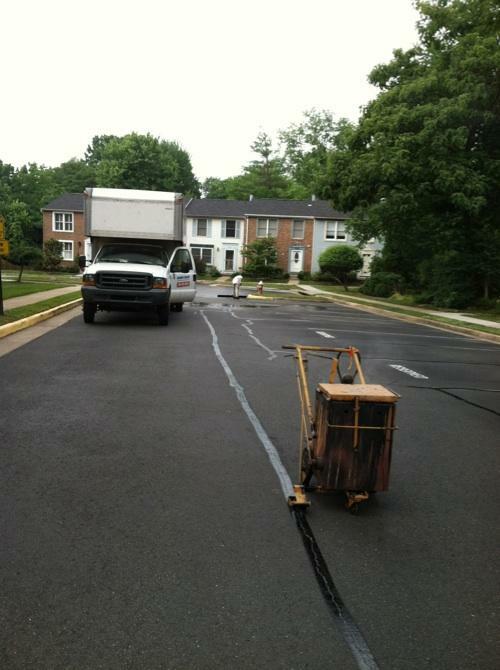 We apply a heavy coating of SealMaster® rubberized asphalt emulsion sealer to the parking areas. The material will be applied by hand using squeegees. Use appropriate measures to block the treated parking areas from traffic when finished. Parking lots generally require 12-24 hours to dry before vehicles can drive on them. We cannot be responsible for damage caused to our application from vehicles that ignore or remove our barricade. Re-stripe the parking areas as they previously appeared or to your specifications. 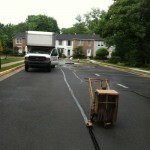 If you need more extensive repair, we also do hot asphalt patching.